KP IS DIV 2 SOUTH CHAMPS - AGAIN!! It was a miserable, wet night in Mansfield last night, but that didn't stop the KP Warriors! They were tough, gritty, and full of defensive power - yup, they were KP. The Warriors beat league rival Mansfield Hornets 10 - 7 in the Division 2 South Championship Game on the road. Games between these two teams are always epic battles and this one did not disappoint. KP heads to Gillette Stadium for the 3rd time in three years to defend their Division 2 State Championship title against the North Andover Scarlet Knights. 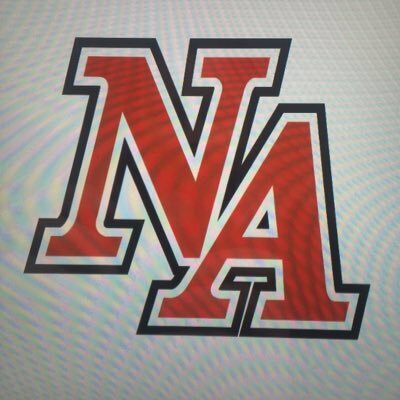 The game will be played either Friday night 11/30 or Saturday 12/1, time and date to be announced later. 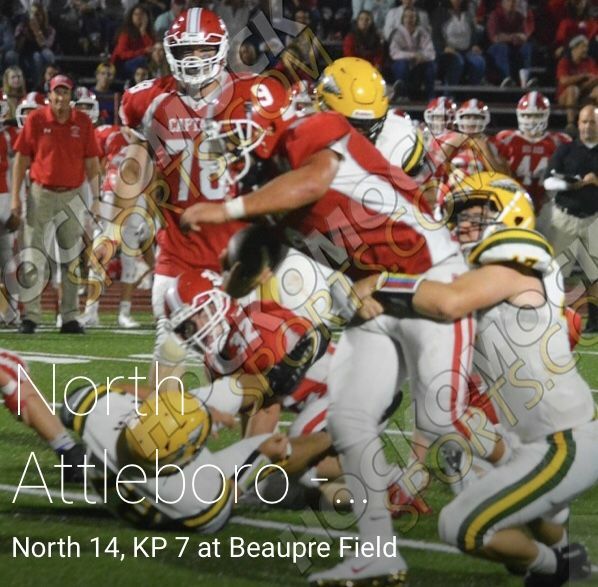 The KP Warriors fought for a big win over Natick in the Division 2 South Semi-final last night. It was a great road win to advance the South Finals next Friday 11/9 vs. league rival Mansfield to see who goes to the Super Bowl. It is sure to be an epic battle and a must-see! The Warriors faced the Mansfield Hornets earlier this season in Hockomock League play. It was a hard fought game by both teams that ended with KP coming back from a 2 touchdown deficit in the 4th quarter, but coming up short with the two-point conversion in the final seconds losing the game 27-28. A win next week would mean a trip back to the Super Bowl at Gillette Stadium for the third year in a row. Last year the Warriors beat Mansfield in the Division 2 South Semi-final Game and went on to win their second consecutive state championship. It should be a good game, don’t miss it. As far as high school football goes it doesn't get better than a game between King Philip and Hockomock rival Mansfield. Last night was no exception! 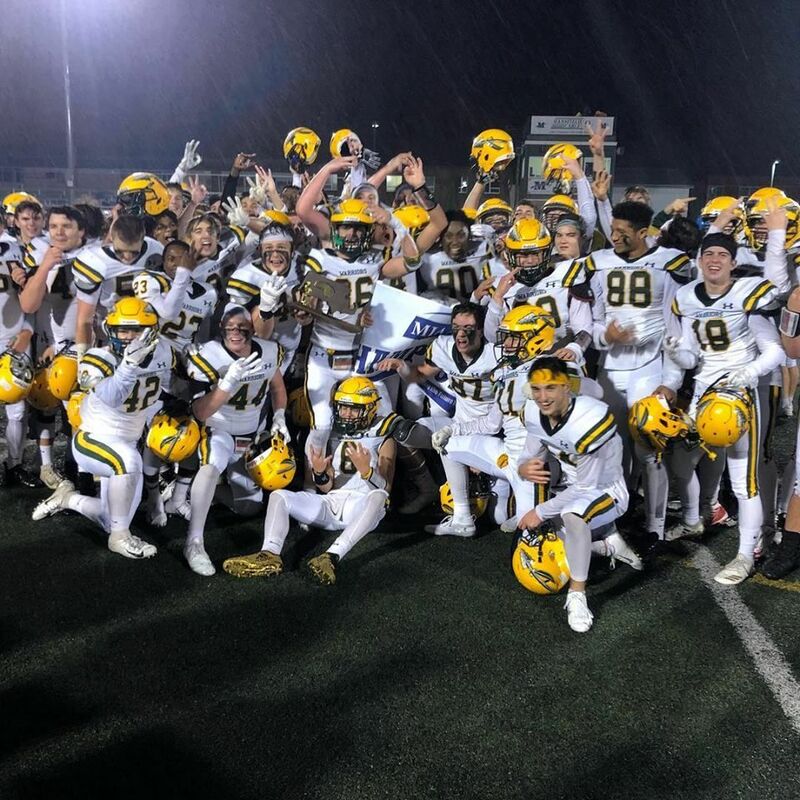 It was a crazy game that had everything - an epic defensive battle, touchdowns, turnovers, field goals, penalties, lead changes, a 2-touchdown comeback with just over six minutes left - and it came down to one 2-point conversion play with 39 seconds left in the game. Both teams played hard as usual and if all goes well they will meet again in the Division 2 South Playoffs. KP BEATS ATTLEBORO 12 - 2! The KP Warriors picked up their first division win Friday night against the 2-0 Attleboro Blue Bombardiers. 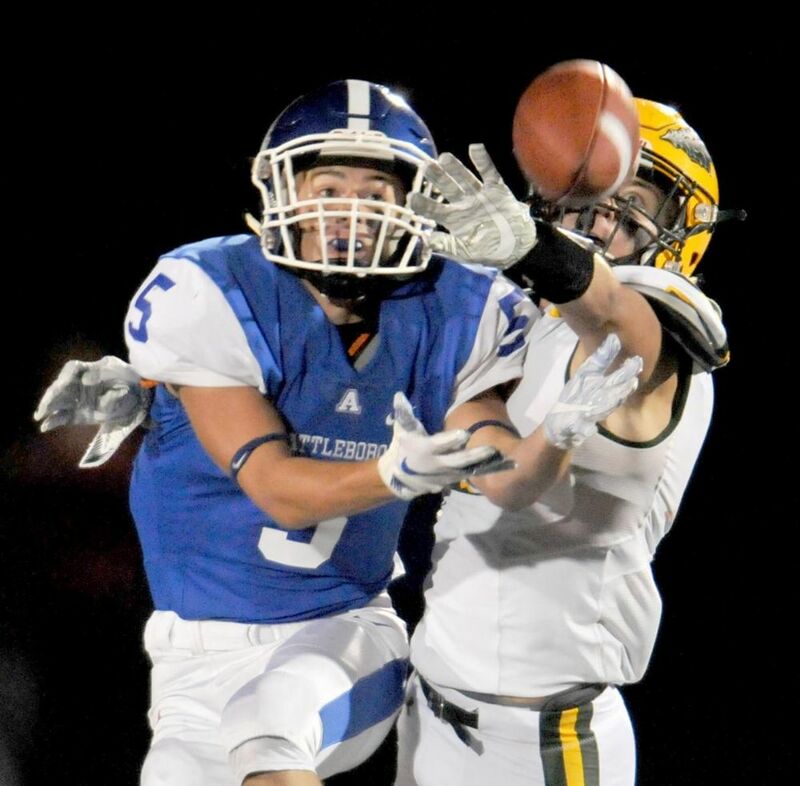 It was a defensive battle with Attleboro's only points coming from a blocked KP PAT run back to the Attleboro end zone for 2 pts. KP scored on a 65-yard drive with #34 Ryan Halliday running it in from the 16-yard line for a touchdown with 1:35 left in the first half. The other two scores came from #37 Cole Baker field goals (36 yards & 27 yards). The physical KP defense was lights out with contributions coming from all areas including four quarterback sacks. The offense totaled 237 yards — 123 rushing, 127 passing. Junior Ryan Halliday had 36 carries for 120 yards rushing and Junior Robbie Jarest was 9-for-13 for 127 yards passing with David Morganelli hauling in 7 receptions for 104 yards. 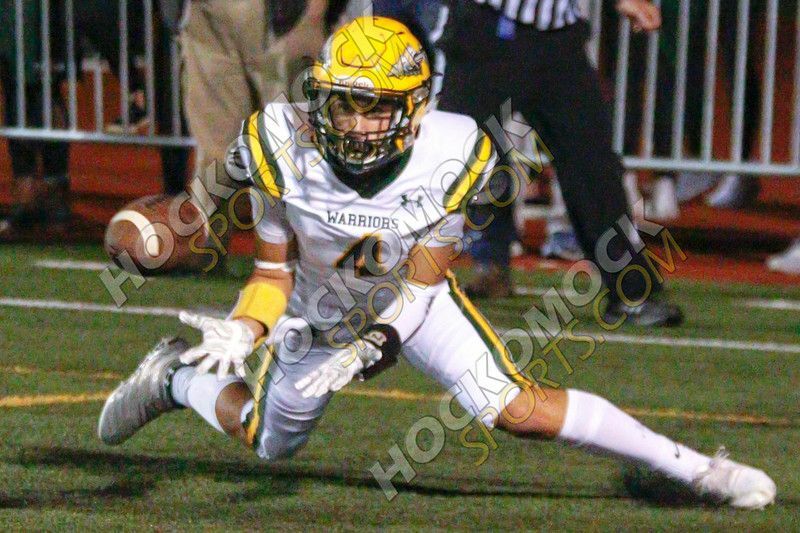 Next week the Warriors travel to Mansfield for another battle for the ages! COACH LEE GETS 100TH WIN! 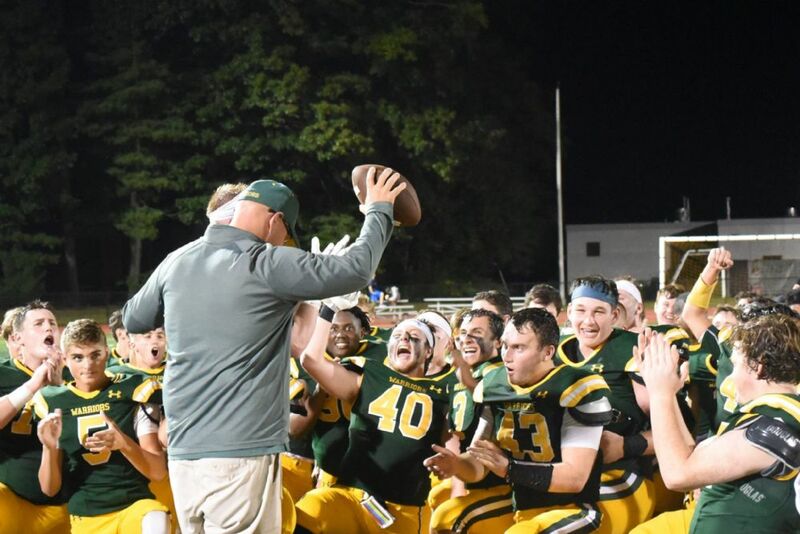 Friday night's 17 - 0 shut out against Foxboro was not only the first win of the season, but it marked Coach Brian Lee's 100TH WIN as the head coach at KP. Coach Lee came to King Philip in 2005 to be the head coach, but also to build a football program. It takes time. Not only do you need players, but they need year-round training and they need to want to work hard. It's a culture change. You also need fans, you need school support, and you need community support. It's a building process. In his first three seasons at KP, the Warriors went 8 - 24. The 2008 season was a turning point when the team finished 9 - 2 for the season, and they were off to the races. They were Hockomock Kelley-Rex Champions 5 out of the last 7 seasons and now have two undefeated seasons with back to back state titles to their credit. It's been quite a ride! Although we mark Coach Lee's milestone, he couldn't do it alone. He has a great support team of loyal & talented assistant coaches and Rich Harwood of KP Gridiron. Plus, a tremendous fan base with great coummity support! GREAT GAME TO START THE SEASON, BUT TOUGH LOSS! TO RESERVE YOUR SPOT, THIS WILL SELL OUT !!! Love the sport of football?? 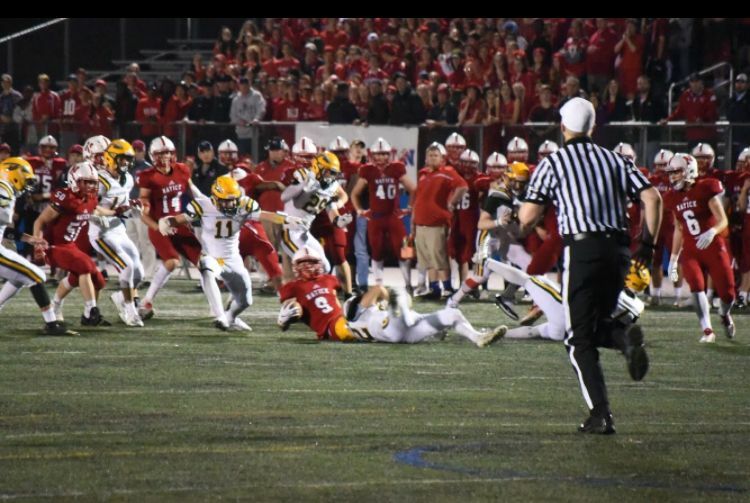 Here is the KP vs. North Andover Division 2 Super Bowl TV rebroadcast from 11/30, if you want to check it out! It was a great, hard fought game between two very good teams but somebody had to lose. Spoiler alert: It was us.